Add Some Salt When You Make This! I have actually posted the recipe that goes with the video below (for Sautéed Dandelion Greens) elsewhere on this blog. 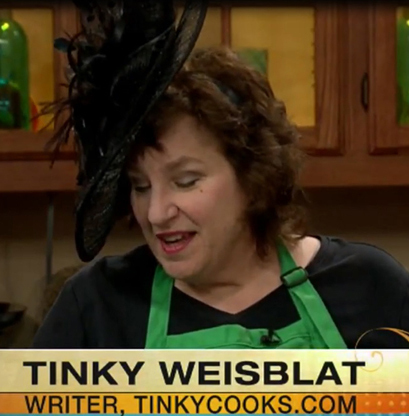 I thought it might entertain readers to see me back in action on TV cooking, however, so I’m posting the video here. And I KNEW you would all want to see my new hat! After we finished recording the segment I took a taste of the dandelions and found them unappetizing, which seemed very odd since I usually like them a lot. I then realized that in my haste to get the dish finished (and in my preoccupation with talking and talking and talking) I had forgotten to salt it. I threw just a little salt on top, and the greens were delicious. Charlemont, Massachusetts, is a musical town. With only about 1300 residents it manages to support a summer chamber-music series, Mohawk Trail Concerts, as well as a yearly reggae festival and frequent performances by singer Charlotte Dewey, the co-owner of and spirit behind the Charlemont Inn. The town has never hosted an opera, however … until now. On Friday and Saturday, a concert production of The Ponder Heart will debut at the Charlemont Federated Church. 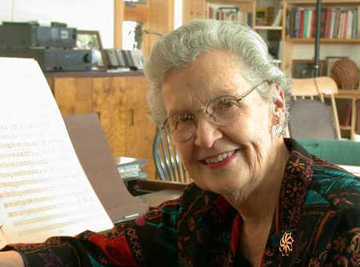 The opera was composed by Alice Parker, a splendid musician and a loyal NOT (neighbor of Tinky). Eudora Welty’s short novel The Ponder Heart first appeared in the New Yorker in 1953 and was published in book form the following year. Alice adapted it into a short opera in 1982 with Eudora Welty’s blessing. Thanks to grants from the National Endowment for the Arts and several local cultural councils, the upcoming production will reintroduce this humor-filled musical gem to the public and provide a concert recording for future listening. As I type, Alice’s Musicians of Melodious Accord are arriving to fill up houses all over Charlemont, Heath, and Hawley and get ready for their final rehearsals. I haven’t seen the opera, although I have read the novella—a delightful comic Gothic piece set in Mississippi in the 1930s. Narrator Edna Earle Ponder is a character with whom I can identify. She tells anyone who will listen, “It’s always taken a lot out of me, being smart.” I have often felt this way myself. Like me, Miss Edna Earle likes to make fudge and keep track of her neighbors. The proprietor of the Beulah Hotel in the small but bustling town of Clay, she knows everyone in town and has an opinion about everything. It is her lot in life to mediate between her Grandfather Ponder and her lovable but impulsive-to-the-point-of insanity Uncle Daniel Ponder. In the course of the story, Uncle Daniel gives away just about everything he owns (including his grave site), marries twice, and goes on trial for murder. It seems appropriate to me that this small-town story will be performed in another tight-knit community, and I look forward to seeing what Alice has done with Eudora Welty’s tale. I’m sure the composer’s ear for vernacular music will do justice to the saga of Edna Earle and Uncle Daniel. Naturally, I have a recipe to share in honor of The Ponder Heart. I was hoping to write about divinity, a confection dear to the heart of both Eudora Welty and Edna Earle Ponder. My friend Bill Kubasek’s mother Win gave me her divinity recipe, and I obligingly covered much of my kitchen in sticky sugar syrup in an attempt the make the stuff. 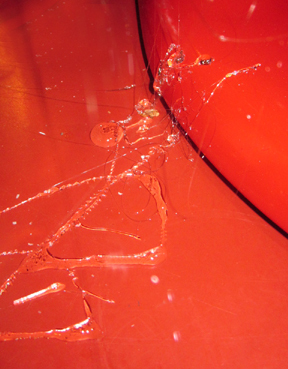 Part of the Sticky MESS! I plan to return to divinity in December, when it should make a lovely holiday gift. Meanwhile, here is a recipe from the composer of The Ponder Heart for a simple, tasty, and fairly healthy dip. 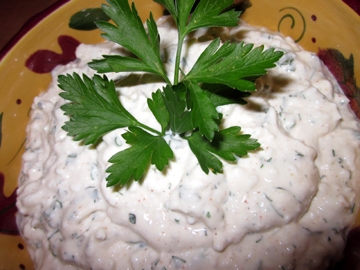 Alice often calls it “Grandma’s Dip” and keeps it in the house to use as a quick appetizer when company stops by. It would be perfectly at home at the Beulah Hotel, where guests, including Miss Edna Earle’s beau the traveling salesman, could dip vegetables or chips in it while listening to Uncle Daniel wax operatic about his trials and tribulations. Try it—and if you’re in New England this weekend, come see and hear Edna Earle, Uncle Daniel, and the townspeople of Clay in the New England premiere of Alice Parker’s Ponder Heart. Performances will take place on Friday, October 8, at 7:30 pm and on Saturday, October 9, at 11 am. Tickets cost $20 and may be reserved by contacting Kay Holt at kay@aliceparker.com. Alice pretty much wings this dip, and I did, too. Adjust flavors to taste, and add anything you think might enhance the mixture. Fresh herbs out of the garden are of course preferred, but you could probably throw in a few dried ones in winter. Combine the cottage cheese and sour cream in the bowl of an electric mixer. Beat in the remaining ingredients. 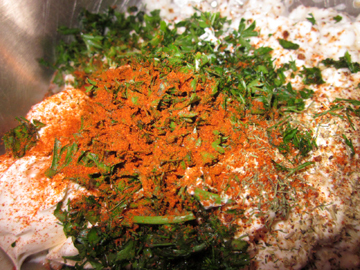 Place the dip in a bowl, and refrigerate for 2 hours before serving. Serve with veggies, chips, sliced apples, or crackers. This dip also tastes great atop a baked potato. My cousin Mardi reported last week that this year’s rainy summer has made the basil in her garden grow to record heights. She asked what she could do with the stuff aside from making pesto and sprinkling it over tomatoes. I said I would think it over. Little did Mardi know that I had a secret weapon up my sleeve: Stockbridge Farm and its annual Pestopalooza celebration. 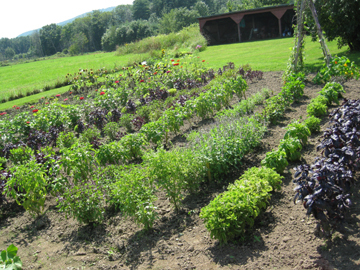 Stockbridge Herb Farm in South Deerfield, Massachusetts, is owned by Mary Ellen and John Warchol and Mary Ellen’s sister Denise Lemay. Mary Ellen, Denise, and John grow herbs and market a variety of herbal products to the public. Every so often they host public events. Their down-to-earth, fun-filled personalities make these offerings entertaining as well as informative. Last weekend they held their annual salute to basil, Pestopalooza. John showed off his healthy herb patch, which features 40 different varieties of basil. 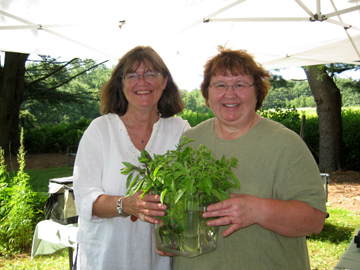 Denise and Mary Ellen cooked under a tent for a couple of hours, demonstrating different uses for basil and pesto. Naturally, I came home with some plants and herb mixes–and a recipe or two. 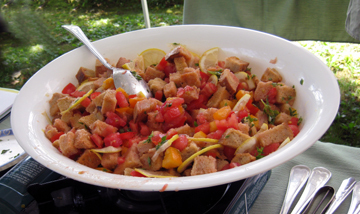 Mary Ellen and Denise explained that one can add other vegetables to this panzanella, an Italian salad starring bread and fresh tomatoes. They used red-basil vinegar, but since my basil vinegar is still steeping (more on that in a future post) I suggest using red-wine vinegar as a substitute. Be sure to wash the lemons well and slice them into very thin pieces (organic ones are best) since you’ll be eating them rind and all. The bread should be at least a day old, preferably a little older; use up your stale bread on this one! It’s a lovely dish for a warm day on which one can’t be bothered to cook. If you want a little protein, add grilled chicken or tuna.